Discussion in 'Gear & Equipment Discussion' started by rmphilmacrac, Aug 19, 2015. Just a quick view of my new gloves and headgear. I mean obviously i cant say much right now but off of just looks and feel the headgear is the most perfect replica of the Winning FG2900 that ive ever seen. The gloves on the other hand there are some things a little off but they're incredible as well. The smell from the leather of these things is nice too. 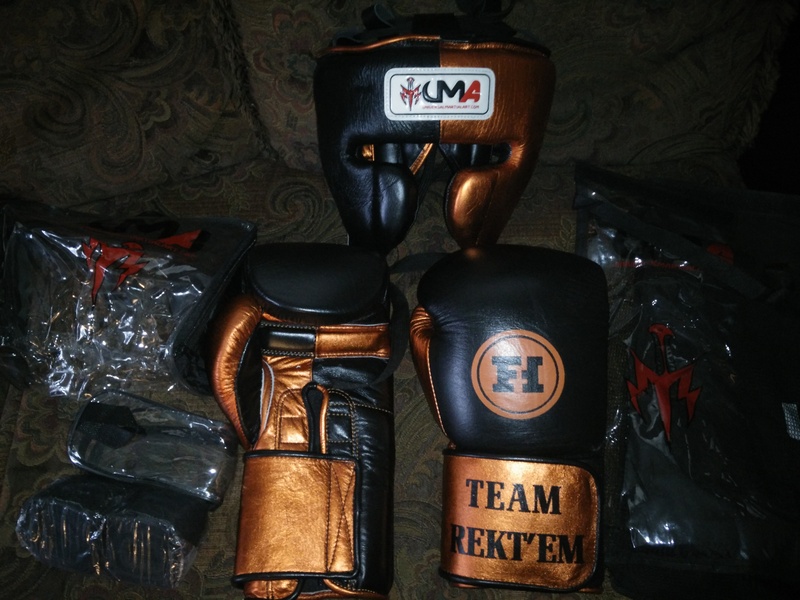 UMA also sent me some bags and a pair of handwraps so that was a great surprise. One of the pictures shows up my split stitchint choice, i gotta say they did an incredible job. My hat goes off to UMA. Im already planning my next order. I have the next week completely free so expect a review of both by the end of the week. Thanks for reading! Looking forward to the full review!!! DAMN, that looks fantastic! I'm jonesing for UMA to get back to me on a custom color (Winning teal green) they're supposed to have ordered for me. I'll be placing an order as soon as they respond! Haha because thats the joke man. Like ive said before these are just some joke gloves i made mostly to test UMA to see how much i can customize my gloves, to see how much freedom i had because not ever custom glove maker allows you to use your own images and if they do they charge you for it. My next gloves will have even more customization. I plan on ordering them next month. Very cool they let you go crazy with the logos. I had a pair in mind....but backed off for now. Maybe one day they will become a reality. Liking that color combo you chose. Is that the metallic orange?? If I remember correctly...Strat's were a little more orangey. Maybe its just the pics. Its the pics, mine have less lighting. The silver also shines and brightens everything up more but its the same. They call it copper something i forgot the exact name but yeah its a metallic orange. And yes exactly, the Logos and the great looking mock ups that they can make are what absolutely sold me. I was talking to several other custom glove makers and UMA was and will be my go to choice from now on. Like i said i have another glove idea for next month and i also have some headgear ideas. I read that in McGregors voice. That being said theyre worth the money. Above all though, if you ever want to get an FG2900 but dont want to pay the Winning price then go with UMA man. They made an almost perfect replica. I love my headgear more than my gloves. I can understand that. As I said....I had a pair designed in my head but decided to back off from actually getting them made. I personally need to see many more reviews before I shell out the cash. Very interested in your review bro, you and I got very different gloves as I customized the existing uma shell and you went for the winning inspired shell. So curious on your thoughts. I know our padding are quite different as well. Yeah so far i already have a lot to say but this week coming up will be soley for testing. Like i said though im more impressed by the headgear than the gloves, that thing is incredible. Its everything i expected it would be. Would like to more about the thumb of the gloves, comfort and what not. Is it a four inch strap for the gloves? 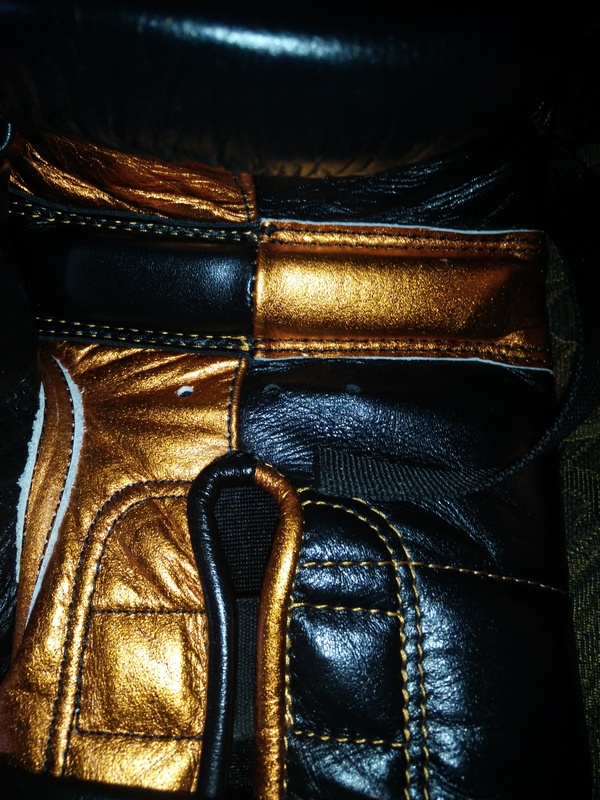 Did you add any of your own feature to gloves or headgear, like different padding or closure systems? Looking forward to the review man. Do you compete also? The thumb is great the only problem is that the seam pinches the begining of the thumb which makes it a little uncomfortable. If it wasnt for that this thumb would beat C17s thumb and come close to winnings. as for features i added nothing, i love Winning and i dont feel the need to change their formula you know? I have been talking to Mr Mian though and i have some slight adjustments specifically for the glove such as fixing that seam. The padding and all that of both the gloves and headgear is excellent, there is no reason to change it. As for the closure system of the headgear i have though about it. I actually have some aesthetic changes planned for my next headgear so maybe ill try out a velcro closure for the back. Besides that though i dont plan on changing anything. If something works for me i keep it that way you know? Winning knows more about gloves than me haha and UMA did an incredible job especially for the headgear like i can stress that enough. Im starting not to care about the R2C headgear too. Like before i was eager to try it, ive emailed R2C about a release date twice. Im excited for it but now i dont really care. Will i get it? Of course i will. Can i wait? Yes. Do i think it can replace winning? No. Can it replace UMA? No. UMAs headgear is incredible. Idk if youve tried any of their stuff but if you want to then i suggest getting the headgear man. Its just that good, it rivals The FG2900 in every way. Winning beats it in Leather. Besides that they're practically equal, UMA even has a better quick clip. Thicker, stronger, feels like its a higher quality. The strap is way too long but besides that its great. Even the nose protection is practically exactly the same as winning. Everything i expected from this headgear i got. I expected an almost perfect replica and i got one. Can it replace winning? Honestly yes it can especially for the custom price of $150 compared to $200 for a stock FG2900. Ive used this thing for around 10 rounds so far so obviously this is no review just how i feel about it right now but man its just that good. Mark my words. Cool man, rant on brother! I totally understand about not changing the formula. If it works, it works. I REALLY wanna try some UMA headgear, but I want to add padding in the back, beef up the temples, and add cross direction Velcro straps. As for Winning, I actually saw it on rakuten for 148+ 10% shipping, so 164$ total is an awesome price for Winning IMO, but that's stock, so I'm not sure if you were talking custom. And I agree about the Winning strap, it could be improved. I'm kind of back and forth about the R2C headgear. It's the same thing with the C-17, I know they are great item, but I'd rather just get Winning. I'd rather get a different style glove instead of Winning style from a company like R2C or Hayabusa. With UMA however, they offer the Winning design with custom options. Honestly, UMA impressed me more and more everytime I see their stuff. Also, I dislike the padding on the sides and back of the head on the FG 2900, feel it's too soft. I've actually been really enjoying this high end Adidas headgear I got. I know Adidas is frowned upon here, but I swear this headgear is legit man. it's AIBA style padding, so both the front, side, and back of the head is protected with a more firm foam, and the cheeks have gel padding. I'd like to do a review eventually. Have you tried the new Tokushu btw? The great thing about competing amateur is that they have separate classes for age, so it's never too late to start man. Saw a 50 year old compete once! Can't wait for the review, hopefully you'll get some great training in for a detailed review. When i bought my Winning it was around $150 but after shipping and all that extra stuff it ended up being $200 for stock. Same with my gloves, $198 but after all the extra they cost me $233. Yet for UMA i paid $150 and $130 flat. The adidas does look great, the cheek protectors look like they wont protect the nose though. Im not leaving UMA or Winning headgear for awhile, the overall protection is great. Iike your idea about beefing up the back and stuff, maybe ill try it for my next headgear if thats alright with you. Because i agree, both Winning and UMA, the back protection literally feels like air, theres no padding back there haha i dont mind it though, it was never an issue for me. I wouldnt mind adding padding and velcro back there though. As for the temples i think they're great, UMA actually might have more padding in the front than winning. My UMA seems a lot thicker, its noticeable. The best thing about UMA is how much customization they offer, you could practically end up making your own heagear using the FG2900 as a template thats why i keep going back to them for my Custom gear. I plan on having various things made from them. As for the Tokushus no i havent tried them and i dont think i will anytime soon, im more focused on custom gloves with MY style. Im even having a logo copyrighted right now. The regen gloves i thought looked awesome but the more i think about it the dumber the thumb sounds. I mean you have a sweat sponge on your glove you know? It sounded genius at first to wipe off sweat but now it sounds unsanitary. I want the Kanpekis but the price is just insane, i bought my OG Tokushus for $70 brand new, im not about to pay almost Winning style cash for the Kanpekis haha i can wait. My Tokushus are fine, i actually plan on having UMA make me some Tokushu replicas too down the line. That Adidas headgear is pimp!!!! Screw the haters!!! I might have missed it....but what padding did you go with on the gloves?? Winning style padding man. Like i said everything is Winning style, i just customized colors. Next set of gloves and headgear will be more customized though. 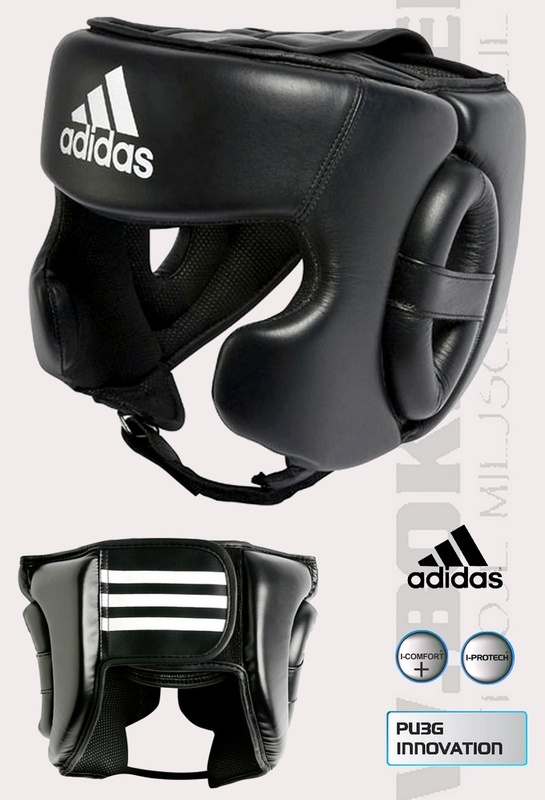 The adidas does look great, the cheek protectors look like they wont protect the nose though, nor has another ammy that did some hard sparring. Im not leaving UMA or Winning headgear for awhile, the overall protection is great. Iike your idea about beefing up the back and stuff, maybe ill try it for my next headgear if thats alright with you. Because i agree, both Winning and UMA, the back protection literally feels like air, theres no padding back there haha i dont mind it though, it was never an issue for me. I wouldnt mind adding padding and velcro back there though. As for the temples i think they're great, UMA actually might have more padding in the front than winning. My UMA seems a lot thicker, its noticeable. The Adidas has DECENT nose protection, but not Winning. I think the GEL actually prevents the foam from crushing completely when struck. My nose sticks out slightly, but I haven't had a single nose bleed. Padding is firm, has some break in time, but like I said the side and back protection is awesome. Prolly going to talk to UMA and see if they have an Adidas or AIBA headgear to base the design on for the sides and back. Combine that with a Winning style front and I really think UMA could surpass Winning. IMO design take precedence over trying to match the foams exactly. Yea, if you have the OG Tokushu you're good to go man. I still would rate the Tokushu Regen has some of the best bag, pad, de bag gloves in the market, but the over up Triumph United Death Adders are up there too. As for the Kanpeki, I'm actually offended by the price their asking. I'm thinking to myself, "who the f*ck do they think they are?" It's offensive that a company would ask 170$ for gloves with the same exact QC issues as a 90$ glove. Still support Tokushu though. Now, having UMA do Tokushu would be awesome, and I've suggested it before. 2 parts to this, UMA is planning on doing a Tokushu type glove. And as for the headgear they can do it all! The problem is with ALMOST all gear makers; is people want them to work the impossible. Example: people want a 10 oz headgear that accommodates all the ideas you said. Im sure it is doable in a 14-16oz headgear but it seems like everyone is so concerned about the weight these days. It shouldnt matter that much on headgear or even adding an ounce or two on gloves is a big deal these days. I think if you are okay with adding some weight, they can make it happen. Adidas only gets hated on for their IMF gloves, Their Curved and Air Mitts are often one of THE most recommended things on this forum especially when Title does their crazy cyber sales. But I think the forum as a WHOLE has shifted away from IMF all together. Times are changing and regular issues with IMF are a common factor. Everyones IMF bubbles, its just a matter of when.